Carpeting is good for the air quality in your home. Indoor air quality is more important than ever. The EPA reports that we spend approximately 90% of our time indoors. Carpeting in your home can actually provide a healthier quality of air in your house. Carpet is made up of piles of carpet that form a three-dimensional structure. This structure traps dust, pollen, pet dander and allergans so that they do not continue to circulate in the room like they would if you have tile or hardwoods. You need to clean your carpet regularly with a good vacuum cleaner fitted with a HEPA filter every week to remove the particles. Carpeting requires less chemicals to clean than other flooring coverings, which helps reduce the amount of volatile organic compounds (VOCs) present in the air. We primarily use a vacuum to remove the dirt. VOCs are an outdoor pollutant emitted from cleaning agents that can accumulate indoors without proper ventilation. If you have tile or hardwoods you will typically be using cleaners that have VOC’s. When scientifically tested, the air above carpet contains fewer allergens and dust mites than the air above hard surfaces, says Kathryn O. Sellers, director of public relations for the Carpet and Rug Institute, Dalton, Ga. She feels carpet is an asset rather than a detriment to air quality because it tends to hold allergens out of the air until they are vacuumed away. But, here’s the catch: the carpet must be vacuumed and cleaned often enough. It is recommended that you have your carpeting professional deep cleaned every year so that any deep down dirt gets removed. When you buy carpet make sure you look for: Certifications like Green Label Plus that certify that the brand of carpet is a low emitter of volatile organic compounds. 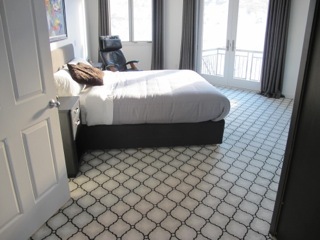 The people at Coventry Flooring can help you choose the best type of carpeting for your needs. Call us today to set up an in home appointment with our mobile showroom. You can also set up an appointment to meet us at our Denver showroom. At Coventry Carpets, we have installed 1000s of yards of commercial carpet throughout Colorado. New Flooring helps you sell your house for more money. Nothing says cozy and warm like carpet. It’s a new year and time for a fresh look for your home with new carpeting! Coventry Carpets is a family-owned and operated referral-based company built on developing relationships with our customers by revolutionizing the way they experience flooring. Scot Johnson and Tom Burns created the company in response.